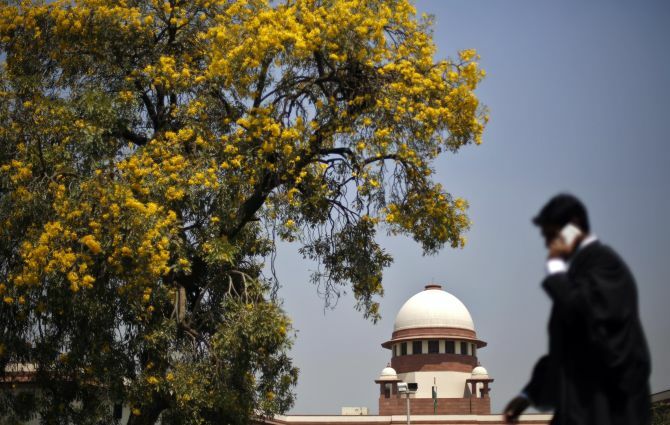 Justices Hemant Gupta, R Subhash Reddy, M R Shah and Ajay Rastogi were on Friday sworn in as judges of the Supreme Court, taking its strength to 28. The swearing in ceremony started at 10.30 am in court number 1 of the apex court and Chief Justice Ranjan Gogoi administered the oath of office to the four judges. The President had on Thursday given his assent to the recommendation of the Supreme Court Collegium for elevating Justices Gupta, Reddy, Shah and Rastogi, who were chief justices of different high courts, as apex court judges. While Justice Gupta was the chief justice of the Madhya Pradesh high court, Justice Reddy was the Gujarat high court's chief justice. Justice Shah was the chief justice of the Patna high court and Justice Rastogi was the chief justice of the Tripura high court. The apex court has a sanctioned strength of 31. With the elevation of these four new judges, the strength has risen from 24 to 28. The Supreme Court collegium headed by Chief Justice of India Ranjan Gogoi and comprising its four-senior most judges, had on October 30 recommended to the Centre the names of the four for elevation as judges in the apex court. Justice Gupta was appointed as a judge of the Punjab and Haryana high court on July 2, 2002, and on February 8, 2016, he was transferred to the Patna high court where he was appointed as the acting chief justice on October 29, 2016. He was appointed as the chief justice of the Madhya Pradesh high court on March 18 last year. Justice Reddy was appointed as a judge of the Andhra Pradesh High Court on December 2, 2002. He was elevated as the chief justice of the Gujarat high court on February 13, 2016. Justice Shah was appointed as a judge of the Gujarat high court on March 7, 2004, and later in August, he was sworn-in as the chief justice of the Patna high court. Justice Rastogi was appointed as a judge of the Rajasthan high court in September 2004 and was elevated as chief justice of the Tripura High Court on March 1 this year. This year, two apex court judges -- justices Lokur and Kurian Joseph -- are set to retire while Justice Sikri will demit office in March 2019.